Furniture collection families by AGATI Furniture provide furniture solutions for public spaces of all kinds, such as public libraries, universities, and aviation terminals. A modern display of wood and metal, the Roland collection creates a striking, stylish design. Stainless steel bases support a floating work surface for an uncluttered profile, and the thin legs and end apron rails add to the fresh appeal. With an intricate quatrefoil and lattice designs etched into each piece, the Gothic Collection is a visually rich study in detail. 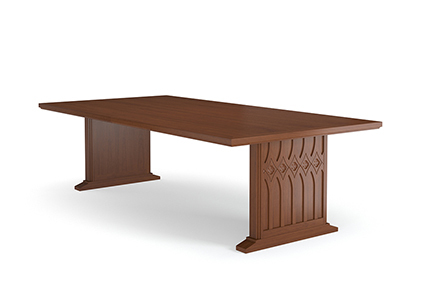 Each piece is recognizable for its beauty and character, harkening back to 12th century Cathedral design. The Frye Collection typifies the Arts and Crafts movement with its strong clean lines and slat detail. Reflective of its 19th century elegance, the Frye Collection is simple in design and reliable in construction. Inspired by the crisp design details of Charles Rennie Mackintosh. The 3-square motif, an important part of Mackintosh’s design vocabulary, identifies this collection and appears as either pierced cutouts or applied squares. Etta is the latest collection to be added to the Agati line-up that embraces a modern aesthetic without sacrificing productivity in public space furniture. Etta is a massive evolution of the proven table-and-chair design which features: curved seat backs, solid wood chair seat and back, and optional electric power. The DePaul Collection exemplifies transitional design. Starting with classic, traditional design and adding a twist of the contemporary, the DePaul Collection emphasizes the inherent qualities of the wood grain, the elegance of designs simplicity, and the importance of craftsmanship. Parallel lines and crisp angles give the AGATI Williams Collection its contemporary flair. An all-wood collection, The Williams Collection adds modern appeal while retaining the warmth of wood furniture. Streamlined and functional, the collection complements rather than dominates its environment. The Brown Collection makes a bold statement with a design motif achieved through the use of reveals. Horizontal and vertical reveal details accent table base ends, showcasing a strong, clean line design.The Brown Collection features contemporary solid wood, slab end tables. Inset, wood veneer tops and solid wood square edges grace each table giving the Brown Collection its unpretentious and simple style. The Cerino table is nearly universal. Streamlined and stylish, the Cerino fits into numerous settings. The collection is functional and durable, without overpowering its surroundings or accompanying furniture. The Cerino collection includes tables, carrels, occasional tables, benches and children’s furniture. The Primary Collection was born out of a need for the essentials. A collection of simply designed, yet beautifully built furniture, the Primary Collection strives to meet budgets without sacrificing style. This collection of furniture proves to be space conscientious and durable enough for the everyday use of educational environments. Looking for a specific product? Check out our Product Catalog. Agati prides itself in providing a wide selection of products to make your public space look and feel the way you want it to.